Lake City Plaza Complex, in structure, is a tall building with almost six floors, each floor occupied by a business house so that it could adjust maximum number of employees in the war torn Kashmir, an FM Radio station be an example, to balm every Kashmiri’s head with the ‘solaced’ Bollywood Music. The building has, now, an electronic lift to haul those managers up whose necks are hard to bruise because of their excessive fat grown from the obscure policy holders’ investments. The complex has been provided with almost five security guards to manage the law and order affairs in the complex which although is populated with first class managers from whom mischief is not anticipated. The guards smoke all day. 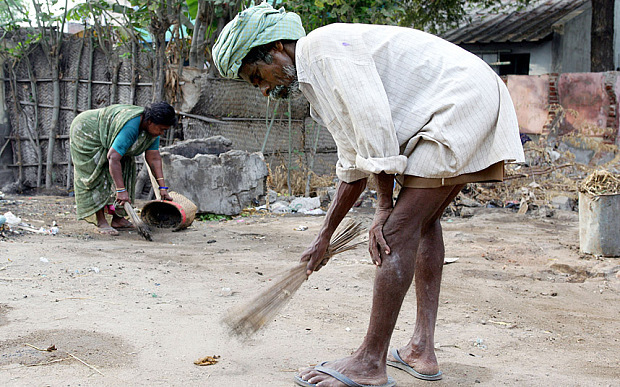 The invisible female sweepers are the dalits of the complex, whose salaries are least as compared to others. being misgoverned; inequality, injustice, unemployment, inflation are their main concerns in this world of nanotechnology. They can’t use lifts, can’t hear FM and cannot be people to be focused upon because of their fault of being ‘Dalits’. In the same Dalit fashion female sweepers work in the high profile Lake City Plaza Complex. People don’t notice them. They are, invisible. What their life is and where they are from is not a question to ponder over, which every businessman thinks. These businessmen only tip waiters of grand hotels only when they are being fed. Sweeper story, however, can’t influence them to Philanthropy. How piteous is it to see an unprivileged Barbie-like-girl rubbing the floors, how awful is it to see the mother peeking at her Barbie-like-daughter and how suicidal is it to glare at the mother when she is broken, tears rolling down the faded wrinkled cheeks half whitened by some unfamiliar disease. In the meantime someone comes and drops a penny guessing the lady as a beggar, again in tears, this time of disappointment and uncertainty. A cry of life’s-last-sigh comes out of the mother’s dry mouth. The old lady is only heard by her daughter. The mother’s cry is ceased by the gentle touch of daughter’s hand as if some spiritual force has penetrated to do the miracle, inside. The daughter smiles but deep somewhere in her heart is an ocean of sorrows which she would at some point of time spill over her eyelids and make the flowers in her mother’s grave re-emerge green and thus pay homage to a neglected soul.Alone and vulnerable are the mother and the daughter. No family, no house to live in and no respect from the ‘humane’ side. The old lady leaves choked and restless as if something is loosening from the left side of her chest may be her valves in the heart are demanding for blood to pass. Bereft people still cross the scene, not a single one to give a helping hand. Hope will never die for them, for they are the self respected mother and daughter, for they are the hard working, for they are steadfast in performing their duties. The girl is about nineteen years of age, has a mole on her left side of nose, has dropped out from school, and has no father; no brother; no uncle; no aunt and no relatives. And has only one kidney.